The project I have been working on for the last two months was a radio for my parents anniversary; but not a normal radio, I got a replica of a 1934 Thomas Radio (Collector’s Edition), gutted it, then built my own system to put music on. I figured for fun I will write a few posts about it, and anyone who wanted to try to reproduce it again would have ample data. To start let us look at the model radio I started with, most will work, just with varying degrees of work put into them. The closet website I can find to the version I have is here, http://tweakeddesigns.blogspot.com/2011/07/reproduction-of-1934-thomas-radio.html. 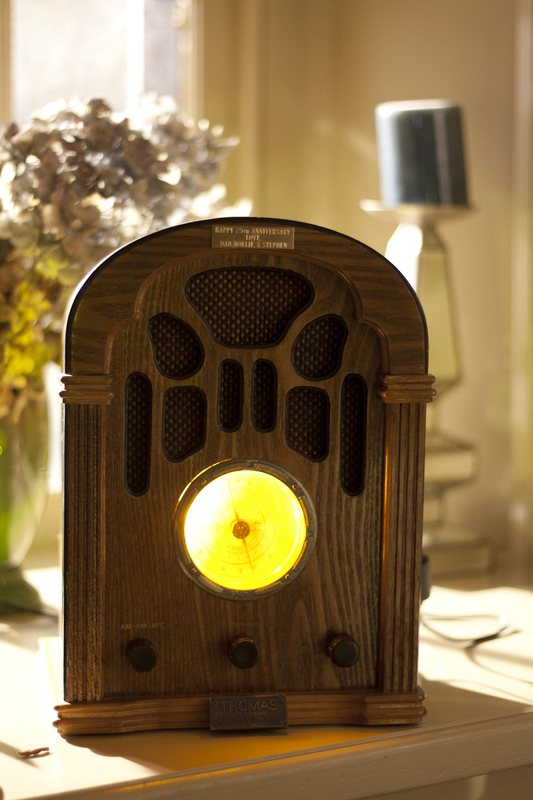 I think this is the exact radio, but with a slightly different wood stain on it. First I got that radio, then ripped all the parts out of it, except for the two outer front knobs (potentiometers). It turned out that the middle knob was just a stick with a string around it that went to a sensor and the channel dial. So the whole dial moved then this string was twisted, but that was only held up by the old internal electronics. Since that was a very… janky, I removed that, and replaced it with a separate potentiometer and a servo to change the dial hands. 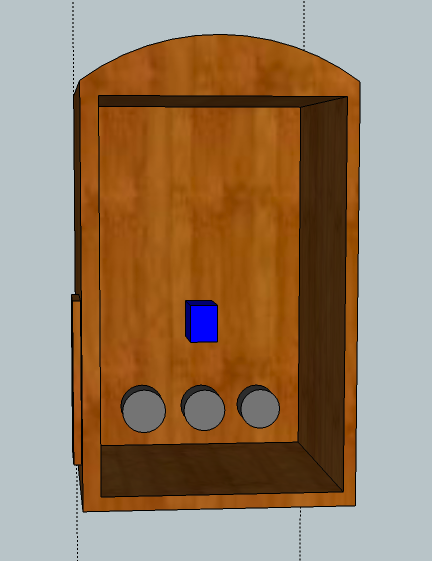 I made a awesomely horrible 3D render of how this looked, with all the original parts removed, and a servo added. I will do another post all about the Arduino and how that was hooked up. Now for the best of prototyping, I used cardboard to support all this, cardboard is your friend for prototyping, except when it catches on fire, then it’s bad. Afterwards, I got these wooden splints from Home Depot, and put them in to reinforce everything, they came in about 14 inches long by 1.5 inches wide by 1/8 inch thick. I secured them with super glue, then screwed the Arduino microcontroller into these supports. Of course with plenty of electrical tape over the wood to shield it all. One key part of the system is how the music is played. 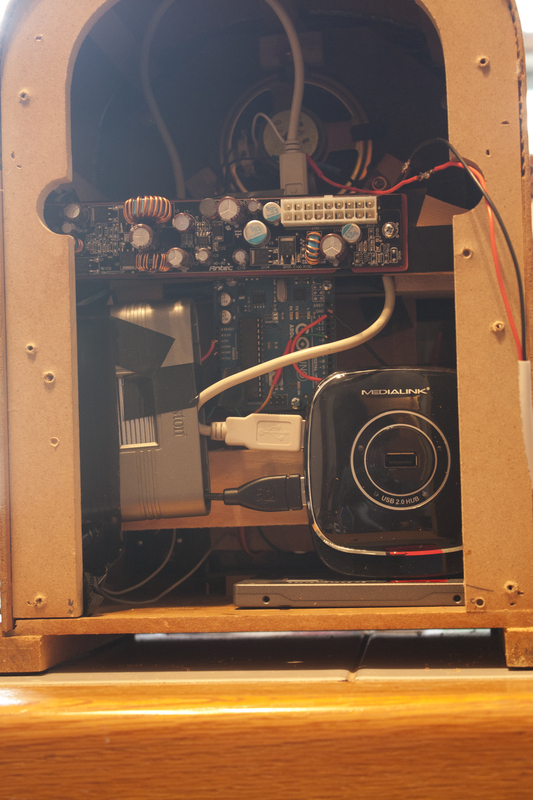 The music is played through a Mini-ITX board that is attached on the back. I needed a power supply for this, so I got a Mini-ITX case(Antec Mini-ITX Case ISK100) and just removed the power parts. The original plan was to put the pc outside this device, in a normal pc case, but I figured I’d just go for this design. Then I drilled a hole in the side so that I could use the Antec cases external power brick, and just plug it in the side. That had plenty of electrical tape on its supporting splint, along with a plastic shield that the power supply part had under it in the Antec case. I don’t like fire, so I was sure to be careful when handling these power systems; also, this was the only splint that was secured with screws and super glue, I dont want a charged power supply falling. The picture below shows this. In a simple wiring diagram, we have the Arduino all wired up, post to follow, that goes into the mini-itx board through a USB hub. The USB hub also has a SD card reader, the software and Ardunio goes into the USB hub to make everything easier. The SD card reader is aligned to the side port, where the tape drive used to be, then songs can be updated by taking SD card out and updating the files. Then we have the original speaker in the radio wired into a 3.5mm headphone jack, available at Radio Shack, I’m sorry THE SHACK, and that goes into the audio on jack of the mini-itx board. The power supply cable goes into the Mini-ITX board, along with the SATA SSD. I know that doesn’t explain it well, but I will be writing more articles, one about the wiring and the Arduino wiring; then another about the software running the Ardunio and on the Mini-ITX board. I’m not great with technical documents, if anyone has any questions feel free to email or even better post a comment.